CLARA (also known as Marie or Masha) takes the stage with her Nutcracker in December. Marat Daukayev School of Ballet begins selling tickets this month for its annual performance of “The Nutcracker” at Luckman Fine Arts Complex, Cal State Los Angeles, 5151 State University Dr.
Clara, sometimes also known as Marie or Masha, and her Nutcracker take the stage with the Sugar Plum Fairy and Snowflakes Saturdays Dec. 3 and 10, at 2 and 7 p.m., and Sundays Dec. 4 and 11, at 11:30 a.m. and 4:30 p.m. The final performance will feature Maria Kochetkova, principal dancer with the San Francisco and American Ballet. The Miracle Mile ballet school’s performance of “The Nutcracker,” and the run up to the event, was featured in the documentary “Getting to the Nutcracker” in 2014. Many local dancers are featured. 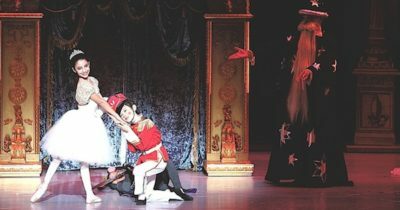 Previous stars of Daukayev’s “Nutcracker” are currently dancing at Royal Ballet School London, Princess Grace Academy, Monaco, Bolshoi Ballet Academy, Moscow, Vaganova Ballet Academy, St. Petersburg Russia, U.S.C. Glorya Kaufman School of Dance and Princeton. For more information, call 323-965-0333 or visit maratdaukayev.com.